Networking isn’t just taking advantage of others to serve your end goals– in fact, it’s just the opposite. Here’s a trio of ways to spark and grow symbiotic business relationships. Traditionally, we have seen the entrepreneur as a lone wolf who creates a big, powerful enterprise on his own. The reality is quite the opposite. Successful entrepreneurs cultivate a network of contacts. Alliances with others will keep you in the know and stimulated, and your business will be more successful as a result. No matter how great your business idea is and how smart you are, you can’t grow a business alone. Of course, we’d all like to believe that business success is based on merit, that the best business idea wins, and that there’s a level playing field and all that. The truth is that a big part of breakthrough branding success is who you know and who knows you. Important alliances and a broad business network will make you richer in terms of options and opportunities and, most likely, financially too. If you aren’t part of the in-the-know crowd in your industry, you will be left out of the opportunities and knowledge that others–your competitors–have. You’ll find networking a lot easier if you take the work out of networking. You make it a chore when your primary goal is making contacts. Make your goal expanding your thinking and getting new ideas for your business and maybe making some lifelong friends in the process. Just this shift in emphasis can make a big difference. You’ll be much more successful in networking if your motive is curiosity and getting to know a wide variety of people rather than hustling contacts or business. People can sense when you’re genuinely interested in discussing ideas and sharing experiences and when you’re interested in knowing them because they can help you. It’s a cliché, but offer to help the other person first. Studies show that it’s smart because of the reciprocity principle. Even just giving someone something of very little financial value, such as an article or lending them a book, usually results in a return favor. So being nice pays off, which is not to say that you shouldn’t be nice for its own sake. The more people you get to know, particularly people from diverse backgrounds and from different areas of the world, the greater the payback to your business, both emotionally and tangibly. Networking is like a business transaction, a system of informal quid pro quo. The networking transaction works like this: I do you a favor, and there is the unspoken understanding that if there is an opportunity in the future, you will return the favor. Defining networking in terms of an economy might turn you off because it may seem, well, too transactional. It might seem less like a relationship and more like using people–too calculated. It isn’t. It’s more like being generous, because for it to work well, you need to be generous with your help to others. You can’t meet everybody, so you’ll have to do some planning (that is, maneuvering) when you go to business events. Otherwise, the opportunities could come and go and you may not meet as many people doing interesting things in business as you’d hoped. One colleague always makes a point of asking questions and going up to meet the speakers, and many of them have become business contacts. She also leaves enough time to mingle at conference networking events–not frantically running around trying to meet a lot of people but trying to have a conversation and connect with a few new people at each event. Because she follows up afterward, she’s even formed business alliances with some where they help each other grow their businesses. As we all know, there is a hierarchy of networking events and organizations. Some business events will have a stimulating program with interesting people to connect with, while others might not be for you. And it’s the same for trade shows and business meet-ups. Then, there are all the online networks and groups that you can be a part of, along with entrepreneur forums, broad business groups, and social networking sites. Make it a point to read the bios of important people and speakers before an event or conference. Look for areas of connection: schools, jobs, interests, or hometown. Google them and check them out on LinkedIn or Facebook to learn more and see if you have friends in common or similar business interests. If there’s a connection or an area of mutual interest, e-mail or call the person to see if you can set up a time for a one-to-one meeting over coffee at the event. Or approach the speaker and comment on her talk. Most people will be flattered, and you’re likely to not only learn more, but you might even form a lasting friendship. A lot of the action takes place in the hallways on break. Reach out and introduce yourself and strike up conversations. Your goal is to meet new people. A good tactic is to go to an event with a friend but split up during breaks to network separately, and if you meet someone interesting, you can bring your new acquaintance over to meet your old friend (and vice versa). You will be known for something, not as a self-promoter. You’ll be doing favors for others in the networking economy. Many new networking acquaintances will become friends. 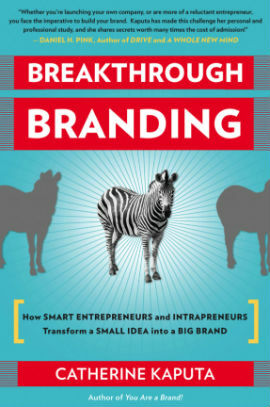 Excerpted from Breakthrough Branding by Catherine Kaputa, © 2012 Nicholas Brealey Publishing. Follow @CatherineKaputa and visit her at SelfBrand.